English Footballer David Beckham and Victoria Beckham's second oldest son, Romeo Beckham is already hitting the headlines for his love life. 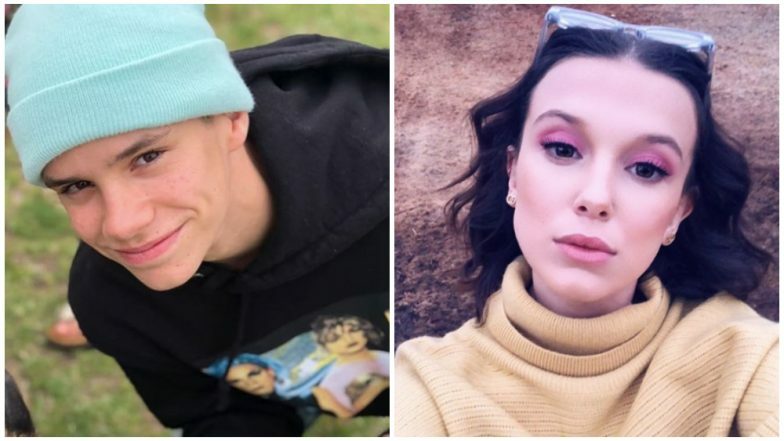 The internet has been abuzz with the news of Romeo dating Stranger Things star Millie Bobby Brown. What's even more interesting is that apparently, Romeo's designer mother Victoria has already given the couple a green signal and may have even mentioned that they make a 'sweet couple'. It all started after fans noticed the loved-up comments that Romeo and Millie were leaving on each other's Instagram posts. From heart emojis to heart-eye ones, the couple made their relationship Insta-official. While fans of the two are really happy with this news, there has been a lot of talk surrounding the age of the duo. How old are Romeo and Millie? For those asking, Romeo Beckham is 16. He was born on September 1, 2002, in London. Romeo is David Beckham's second-oldest child. He has an older brother Brooklyn who is 20 and younger brother Cruz, 14, and sister Harper,7. Millie Bobby Brown is 15. The Stranger Things star was born on 19 February 2004 in Spain. Victoria And David Beckham's Daughter Harper Is Anna Wintour's Mini-Me Version And This Picture Proves The Same! How did Millie and Romeo meet? Well, not Eleven but Millie's certainly getting lucky. Before this, Romeo hasn't been public about his relationships but considering the couple are already Insta-official, looks like the much-in-love couple have decided to not hide their relationship.